Health Minister V S Sivakumar said that “The government, right from the beginning, has been promoting traditional systems of medicine in the state. Now, Ayurveda dispensaries have to be opened in only five more panchayats and Homeopathy dispensaries in less than 40,” . Expressing hope that the process will be complete within a few months- before the tenure of the UDF Government ends. 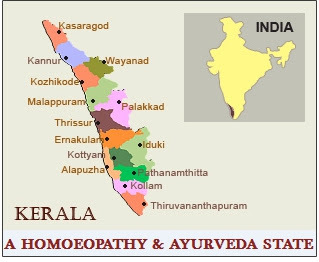 Kerala was going to become a total Ayurveda state soon. On starting the Homeopathy dispensaries in the remaining panchayats, he said the government had taken all necessary steps in this regard. Meanwhile, AYUSH secretary M Beena said that the mission would be complete with the setting up of few more Homeopathy dispensaries. As far as Ayurveda dispensaries are concerned, only a few panchayats are left, she said, and added that the government was taking all efforts to achieve the goal. “It was government policy to strengthen the traditional system of medicine in the state. A separate AYUSH Department was set up exclusively for the development of traditional medicines,” Sivakumar said and added that all the dispensaries that were started have been functioning well. However, there is still a dearth of Ayurveda dispensaries, run directly under the Indian Systems of Medicine (ISM) Department, in state. The establishment of Ayurveda and Homeopathy dispensaries in all the panchayats was a long-pending demand. It has to be noted that the previous LDF Government had also mooted such a proposal and taken some lead in the direction.